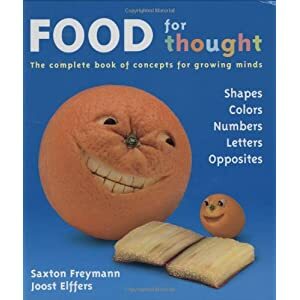 Food for Thought by Saxton Freymann and Joost Elfers is a lovely picture book about shapes,colours,numbers,letters and opposites. We bought this when Defne was two years old. The pictures are a candy for the eye. Derin has also showed interest in this book from very early on,from about 3 or 4 months. I will always remember how he used to smile when he looked at this book. I haven't seen this before - love those awake/asleep mushrooms! Thanks for the share - think I will hunt this down for our bookshelf. Those are cute pictures! I like the potatoes!